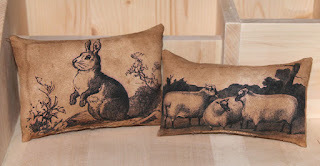 Primitive Pillows from Free Graphics! Easter Candle Mat and Winners! 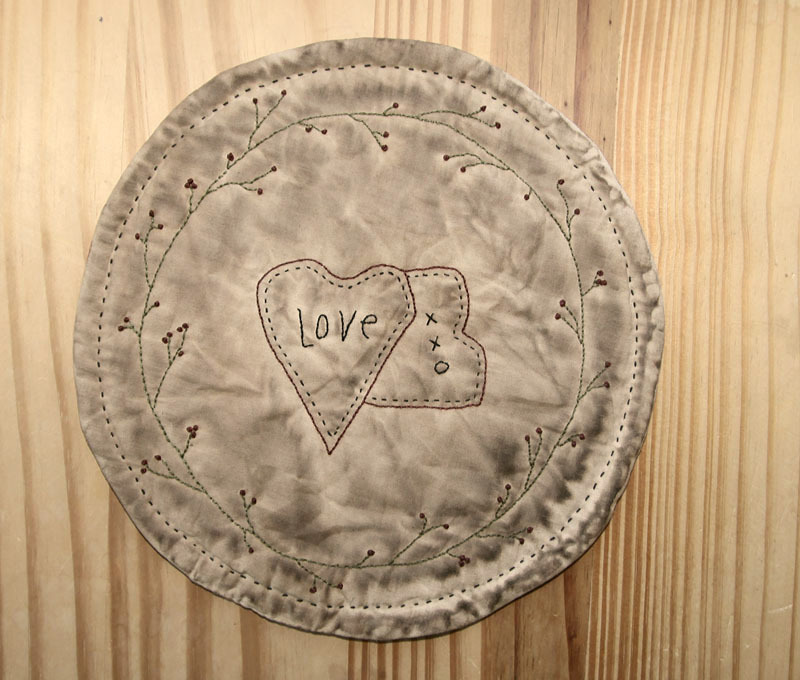 Valentine Candle Mat and Giveaway Day! 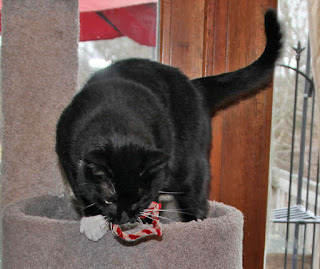 Old Cats ... New Cats Giveaway! A while ago, I had bought some Inkjet fabric sheets and decided it was time to try them. I didn't know what I had bought, it says, sew in sheets, so I think I got the wrong type and wasn't sure if they would work. The sheets are a bit stiff but that makes them nice for printing. They do print out nice and clear and the colors really come out nice. After you print them, you let them sit to dry the ink, then heat set them with an iron. I waited a day and then ran them under cold water, which sets the colors. The only thing was, the red shades did run, but as you can see by the photos, antiquing them, took the hue away. This design I printed out, about a year ago and I think I got it from a free postcard site. I found this alphabet print at The Graphics Fairy, loved these two the most and had to make them into pillows. Love the old time look to them. The last two are also from The Graphics Fairy. I printed out too large, but they still make nice pillows to add to a spring or Easter setting. 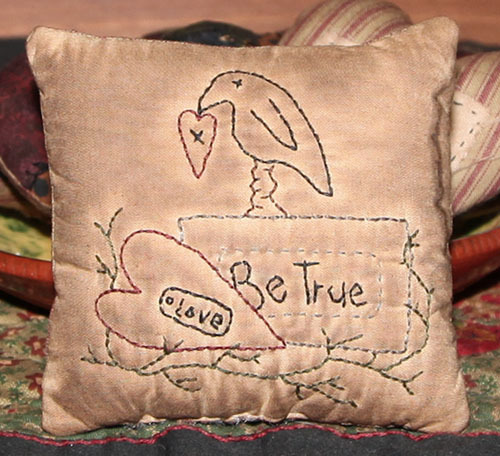 If you visit The Graphics Fairy, you can find a lot of wonderful designs to print for pillows or altered art pieces, lots of possibilities. I really had fun making these and was so glad when they came out so nicely. Next time I will try the regular fabric sheets to see how those work. 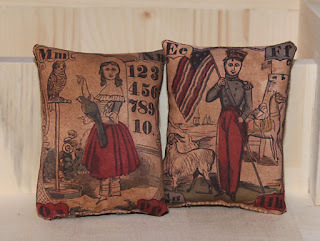 This week I got a wonderful surprise from Carol and her husband, of Firecracker Kid Primitives. 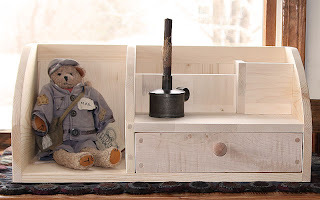 I have been looking for a piece to put mail in, that is also a piece that I can decorate on and big enough that the cats won't knock it off of the bureau. Carol's husband filled my wish list and then some. I have a place to put mail, and plenty of space to decorate with and I can say, the kitties are not too happy that I took their window spot, lol. They left it unfinished for me, so I can do my own painting and antiquing. It is 25" long and I can't wait to finish it and decorate around it. I am thinking of going with a black and mustard layered paint and will be sure to show you a photo when I finish it. Another thing I noticed how well their packaging is, lots of bubble wrap to protect the piece and padding in the cubbies for added protection. If you have ever wanted quality wooden pieces for your home, be sure to visit their etsy store, Firecracker Kid Primitives. They will also take custom orders, as well. At the moment, I am working on some projects that I cannot share just yet, but I will be sure to post when the recipient gets her gifts. I am fighting off another flu, so working a bit slow these days. 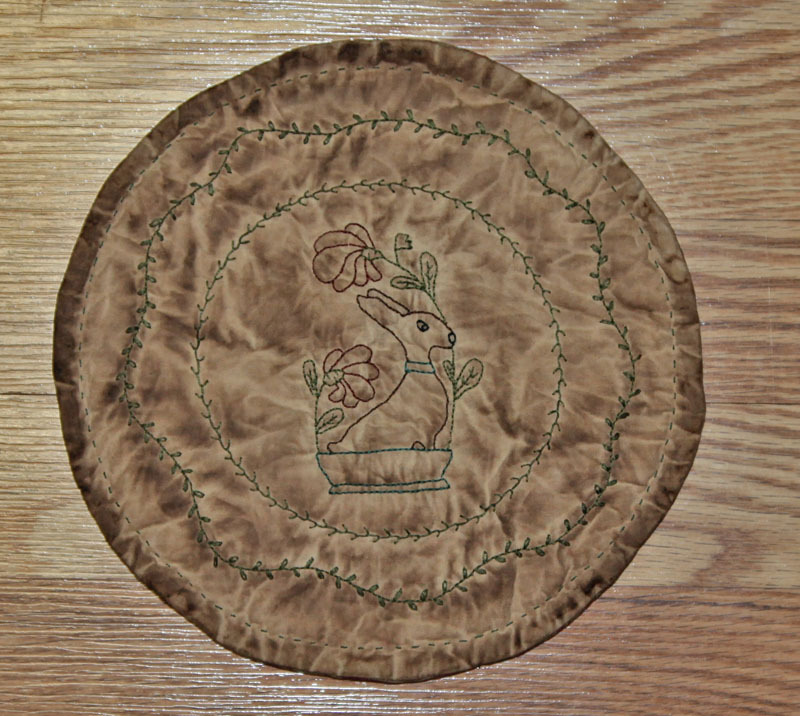 I decided to try an Easter mat and use one of my patterns for the center design. The bunny is from my Spring Flock pattern. I am having fun trying different designs to see what I like and how well they look together. I think I might like this one better with the leaves on the inside and the feather on the outside? 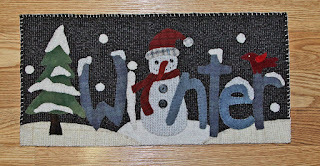 I picked two names, each person will receive a gift certificate number which they can use at the Quilt Show. The winners are..... Cindy and Anna! Email me and I will send you, your numbers. Thank you for joining in and I always love feedback. I wanted to make a candle mat and wanted something simple, but nice, so I designed my own. I did a simple stem design with some hearts and I think it came out nicely. I am trying another one and plan on making more and trying some new designs. For today's giveaway, I have two 6 month gift certificates for the Quilt Show. I will pick two names from today's comments. I would like to know what you think of my new design, do you like them simple or more detailed and what types of designs would you like to see in the future? Would you want a single pattern to print out or a detailed pattern with instructions? I will leave the contest open until Monday night, the 21'st at 9pm EST. First of all, the correct answer was 32", yes he is a big cat and his head was bent. I tried to measure him while he was laying on the bureau, but he thought I wanted to play and tried to eat the measuring tape. So, the winner with the closest guess was Paulette! The winner of the random number generator was #2 Tubilinha Tiacarminha! 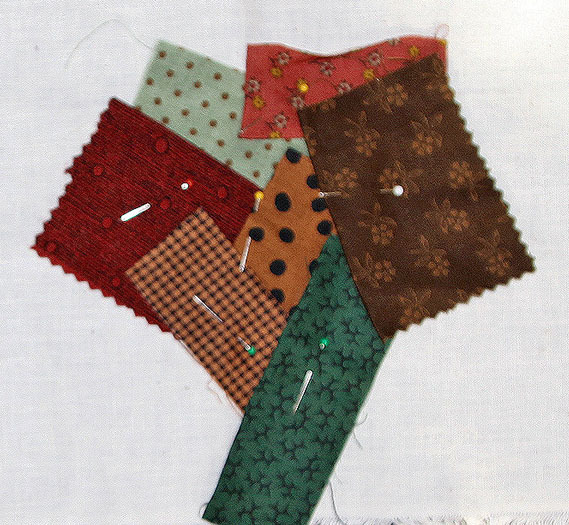 You can choose a pattern or ebooklet from my ecrater site, link in the left hand column. Email me with your choice and I will send it to you. Congratulations! 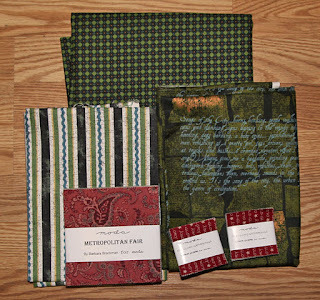 Look for another giveaway on Friday, something for the quilters. This week I have been fighting off the flu, and the weather has been rainy, so it is a good time to relax inside and work on small projects. 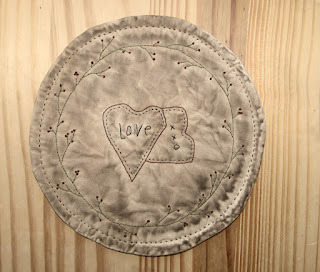 I love Kathy Schmitz's designs and she has some free designs on her website that you can enjoy making. 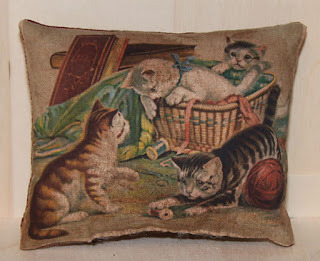 This one was for a tea towel, but I loved the design and wanted to make a pillow. I kept it simple and antiqued it, but the camera really didn't want to give me a good shot, and I had to use flash since it is dark out. 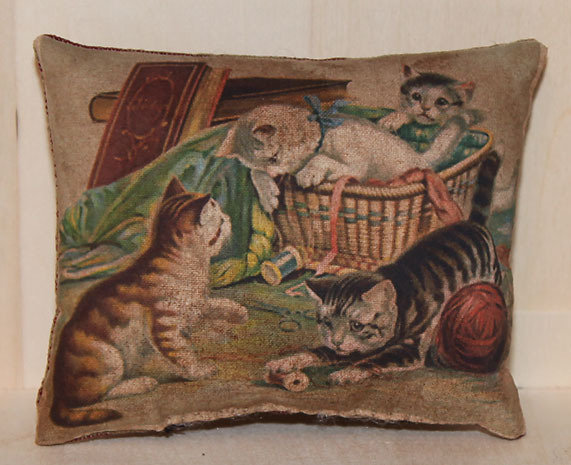 The pillow is tea stained muslim and stained again, by me, but it looks shiny in the photo. I forgot to add details to the body, that is what happens when you are sick and dense, lol. Another design I found for free, this week is, Valentine hearts. I loved how the word love looked and had to try it. I made flat ornies out of mine, using two pieces of batting to fill the middle and just stitched the back on, leaving the edges raw. I over stained these, so I rinsed them out and re-dried them to lighten them back up. The pattern is by Cheryl Fall and can be found HERE. There are two others that you can do, as well and the actual pattern, that I didn't see until tonight. I found the design and now I see how they were actually done. I had a request to show the quilted piece that I made with the new design. This piece was done a few years ago and I added other things to this piece to make it into a wall hanging. For the pattern, the design is made to fit an eyeglass case, but it would also be nice to make into a hooked rug to hang on a wall, as well. Moki is still fascinated by chenille candy canes, he loves playing with them and one of his favorite games is catch. 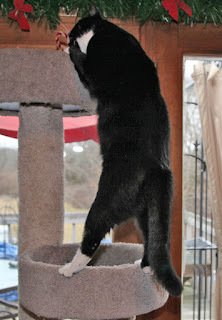 So I throw it onto his tower and he climbs up to get it, he does need the exercise, he is a very big boy, lol. As you can see he can stretch out with his long body. I measured the area that Moki is in and now you get to guess how many inches the area measures, from his toes to the top of his head? The person with the right guess will win a free epattern of their choice and I will pick a winner from all of the guesses, to win a free pattern, as well. I will announce the winners on Wednesday, the 16th. I have been working on a new pattern this week and I hope you enjoy it as much as I do. 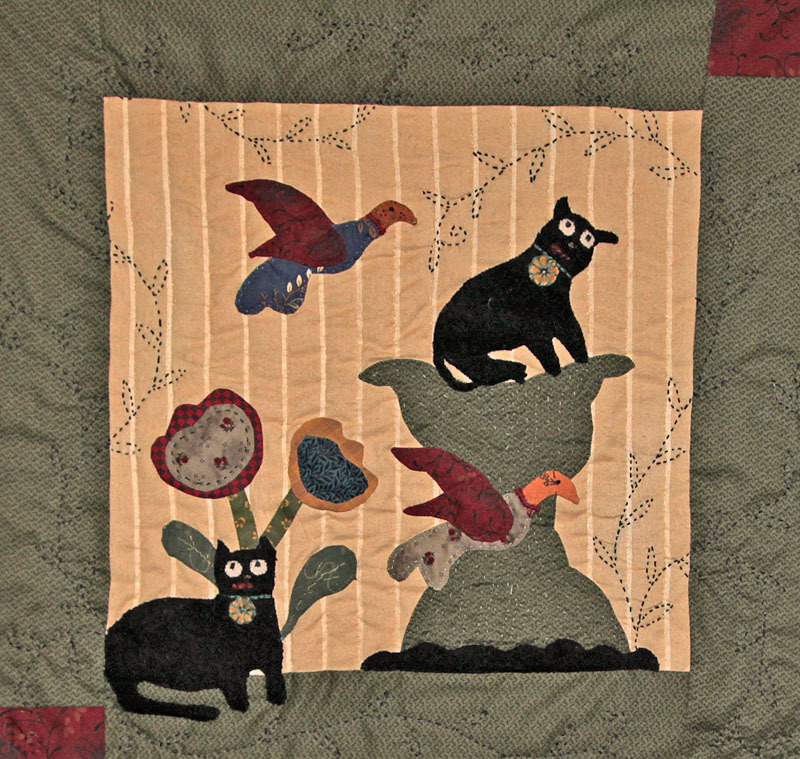 It is based on an old quilt appliqué, that I had made into a small quilt a few years ago. 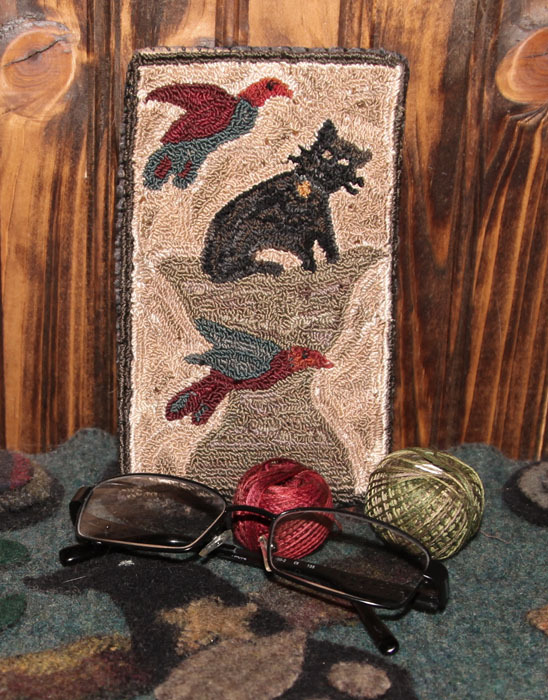 This piece was made into an eyeglass case, but I think it would be nice as a pillow, hooked or in wool appliqué. I have a link to the left, if you are interested in buying this pattern. It is in a pdf format with a color photo, black and white pattern and some basic instructions and color choices. This is an epattern, once payment is made, you will receive the pdf file in your email. As usual, my camera will not read the colors and the shading, no matter what lighting I use. My piece is a bit more prim and not so bright and bold, as in the photo. Those are my husbands glasses, I need new ones since my last pair was stolen with my purse, last summer. I always love feedback, tell me what you do and don't like about the new pattern and what you would like to see in the future. Since I am sick, I decided I needed something simple that I could do in my lap. I have made crazy hearts, but I wanted to try them differently, this time. 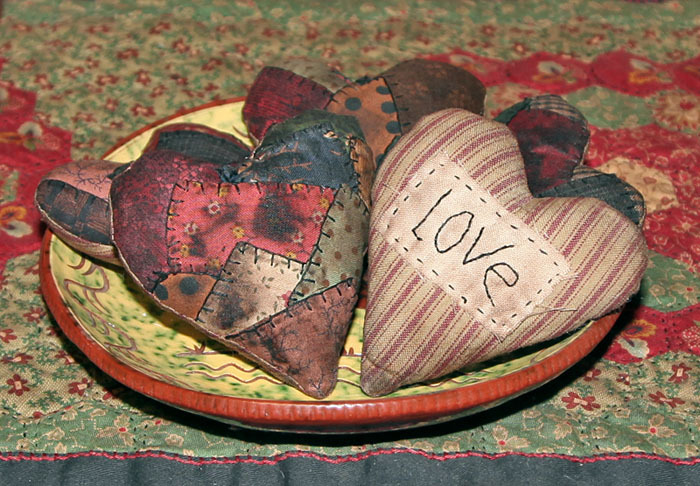 This is a great project to do if you want to use up scraps and have some bowl fillers for Valentines. I just used scraps in my basket, any colors will do. 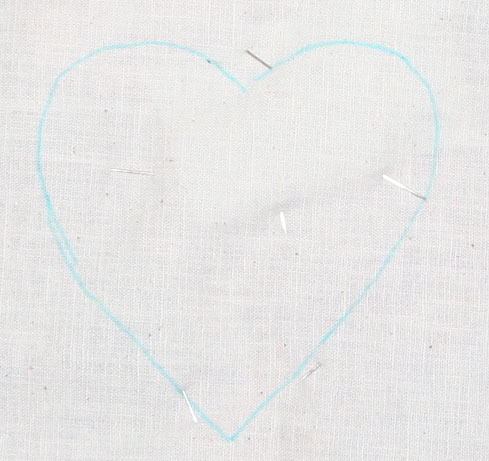 With this method, I drew out a heart on a light fabric, and tracing it on the back, as well. This way you use the front side for the fabrics and when you go to sew it together, you have the design on the back, to follow. I used a washable blue pen, but any pen will do, you won't see the lines. I cut and laid out the pieces to see how they looked and just layered them on top of each other. Once I got the look I wanted, I glued the edges down, to make it easier for layering and sewing. 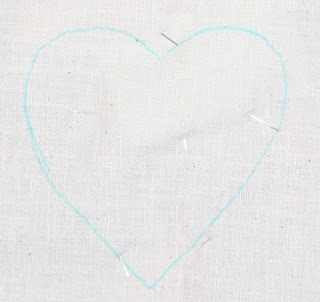 I used a blanket stitch around the edges of the pieces, and using the heart on the back, I could look and see where my stitches ended, so I went past the heart shape, but not any further. Once the pieces are sewed down, you can trim off the excess. I used red ticking for the back and sewed them, right sides together, using the tracing on the back as a guide. After it is sewed, cut a slit on the back and turn them, right sides out. After you stuff them, sew up the opening and cover it with a little tag. 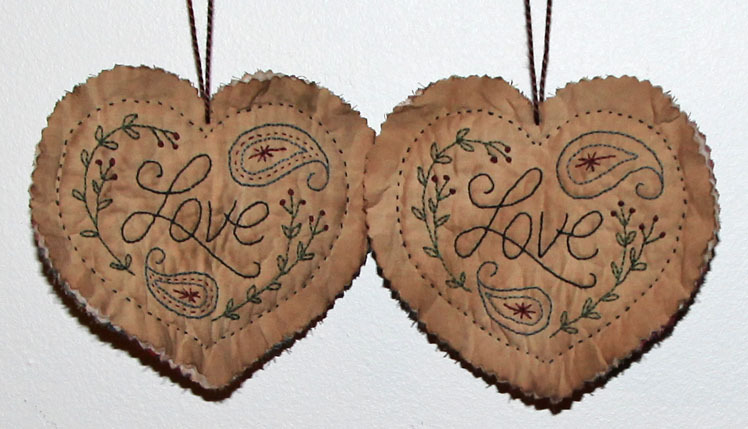 I stitched the word love on mine, then sewed the tag to the back with a prim straight stitch. I soaked mine in watered down, walnut ink. By mixing it with water, you can control how dark or light, you want the stain. 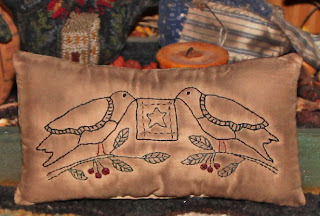 I also made another pillow, using a design by Primitive Blessings. 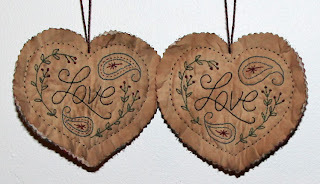 These are fun to do and you can place them on shelves around the house, or give them as gifts to a friend. I also found some new freebies that look like fun and thought I would share them. Debbie Mumm has a really cute BOM with owls and flowers, would love to make this one. Fat Cat Patterns has a new BOM for 2013, lots of fun fish blocks, another fun one for kids or a great beach quilt. Marjory of Peck's Pieces has a wonderful snowman and santa quilt that is available for download and she is also doing some valentine pieces and other quilts to share with her readers, so she is definitely a great blog to follow. I have been fighting the flu that seems to have hit most of us, so resting at home and working on some small projects. 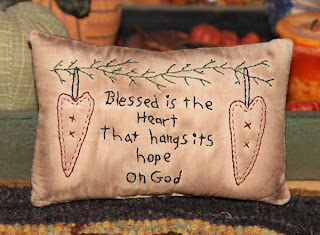 One of my favorite places to find free patterns is Primitive Blessings. Tiffany has a lot of free patterns with all types of designs. 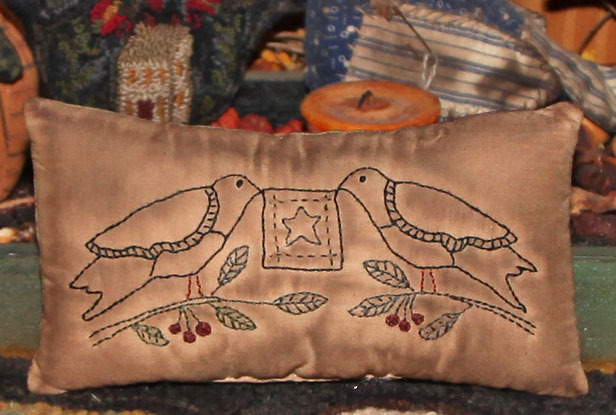 One trick I use when I make stitched pillows is to put a piece of batting behind the muslim, so I get a nice quilted look and it hides the stitches better, so they don't show through. After I finished the pillow, I added walnut spray to give it a nice aged look. What I like about this design, is that it is simple to stitch up and you can change the sayings if you wanted. This week I received some wonderful gifts and goodies from giveaways, that I entered and I wanted to share them with you. Brenda from THE RUSTY THIMBLE makes wonderful primitives that she sells in her ETSY STORE and she also has giveaways to share with her readers. I was the lucky winner last month of one of her snowman ornies and I just love him. Her creations have so much character and are beautifully made, a picture does not do it justice. 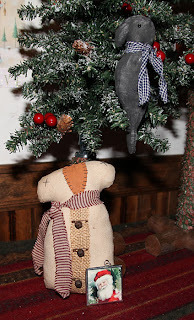 She also surprised me with some extra goodies, a wonderful prim crow, that will look great in a grouping, any time of the year and a beautiful santa charm. I also want to thank all of you who voted for me in the THIS-N-THAT quilt contest. It seems that 4 of us had the same amount of votes and they were generous enough to give us all prizes. I picked out 3 different yards, one with green print for christmas quilting, the fabric with writing made me think of art quilts, so I will have to come up with ideas to use it with and the zig zag print was neat, lol. It has a bit of a prim look to it, so it will be fun trying to come up with ideas to use it in. 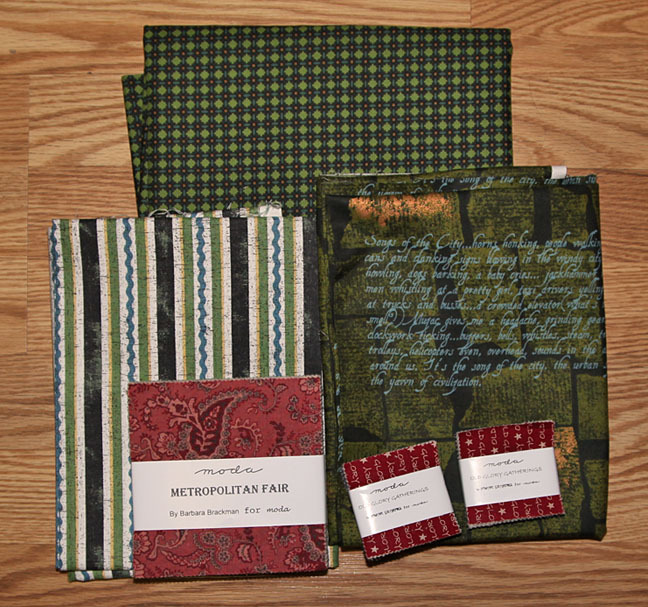 I also got Barbara Brackmans new Metropolitan Fair and two mini packs to make mini quilts with. THIS-N-THAT FABRICS is having a great sale on fabrics and charm packs, so if you need to add to your stash, now is a good time to stock up. Today I finished a new piece for next year. I will be working on Christmas all year long, so I can make all the pieces that I never got to, this year. I will also be finishing some projects and quilting some tops, so hopefully I can get it all done. I also want to make a quilt for a new Grandson who will be arriving in May. This piece was made with a design by Buttermilk Basin. The original design has tongues on the sides, but I decided to leave mine out and blanket stitch, in cream floss, around the edge. I will be using it as a wall hanging instead of a table mat. 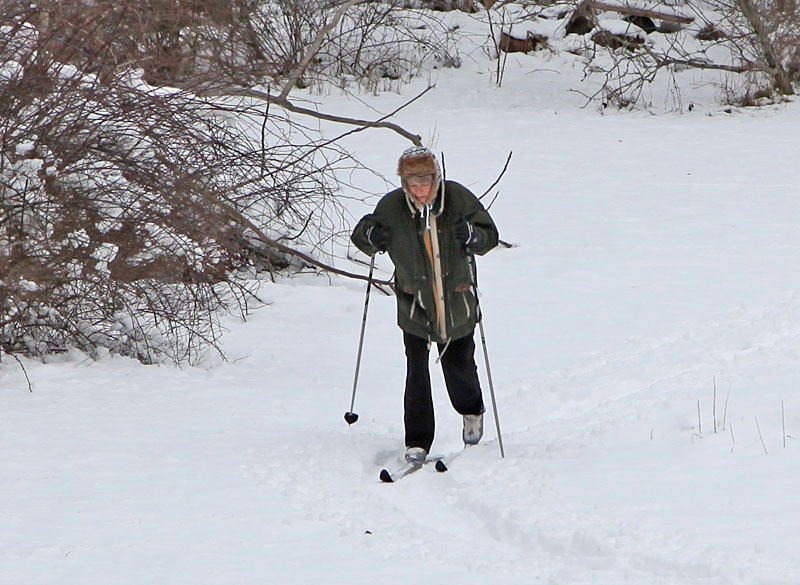 One thing I love about winter is the snow, especially when we get just enough and it stays on the ground. 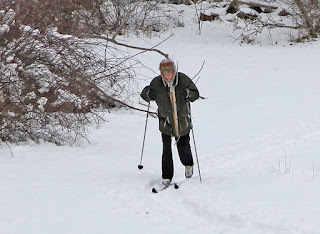 Bill was taking photos of me while I was out getting some exercise. I dress for warmth, definitely not fashion, lol.